Brown trout are the indigenous species in Scotland and they exist in almost all natural waters, from the tiniest burn to the largest lochs. Sometimes they grow very big in lochs by feeding on smaller trout and charr, reaching to over twenty pounds in weight. These fish are known as "ferox". For the most part however wild trout of fifteen inches or more are highly regarded as sporting quarry by anglers. Although the trout season opens in March, fishing does not really pick up until April when large hatches of insects start to bring the trout to the surface for an easy feast. April, May and June offer tremendous trout fishing opportunities on the rivers and on many of the smaller lochs. Later in the season early morning and late evening provide the best chances of success during hot weather. Come September, the waters start to cool again and during the last few weeks of the season daytime hatches again occur. Trout fly-fishing divides itself neatly into two categories, rivers and natural lochs. 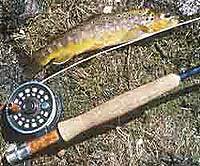 The season for brown trout fishing is 15 March to 6 October. Scottish trout vary tremendously in their characteristics from loch to loch and river to river. Their colours can be amazing, bright reds, yellows and orange, greens, indeed every colour in the rainbow. Their feeding patterns are quite varied also and so they can be caught on almost any fly or technique - provided that it is the correct one! Often the beauty of the fish alone is sufficient to make the angler gasp in admiration. This colourful little trout was taken from a high mountain loch where its ancestors have survived for thousands of years.